Three months after making Olympic boxing history in Brazil, Claressa Shields is getting ready to make her professional debut in Las Vegas, Nevada. The 21-year-old Shields will fight former USA Boxing teammate Franchon Crews November 19th on the undercard of the Andre Ward – Sergey Kovalev world light heavyweight title main event at the new T-Mobile Arena in Vegas. The Shields – Crews encounter will be a four-round bout at 168 pounds, three pounds heavier than Shields’s fighting weight in Rio de Janeiro in August. 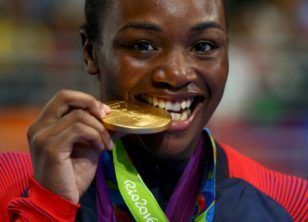 In Rio, Shields became the first American boxer, male or female, to win an Olympic title twice in a row. During a recent workout in New York City, she said she hopes to raise the profile of women’s professional boxing. Claressa Shields was dominant in the amateur ranks, winning 77 of her 78 fights. Her only loss was to England’s Savannah Marshall at the 2012 Women’s World Championships in China. Shields, though, felt like she won that bout, saying Marshall ran from her the whole fight. Shields was born and raised in Flint, Michigan, and she was introduced to boxing by her father, Bo, who was in prison for seven years of his daughter’s childhood. After his release, Bo talked with Claressa about Laila Ali, the daughter of the late heavyweight champion Muhammad Ali, and the last big-name star in women’s pro boxing. Laila Ali competed from 1999 to 2007 and she retired undefeated with 24 consecutive wins. 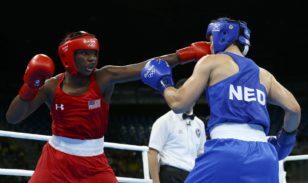 While Laila earned attention simply by being Muhammad Ali’s daughter, she did not have the Olympic experience of Claressa Shields, who says she has always worked and trained hard since first putting on the gloves at age 11.